Hey guys, it’s sweet potato soup time!! Yay! This soup actually happened by accident. (A DELICIOUS ACCIDENT.) I wanted to make a sweet potato sauce for pizza. 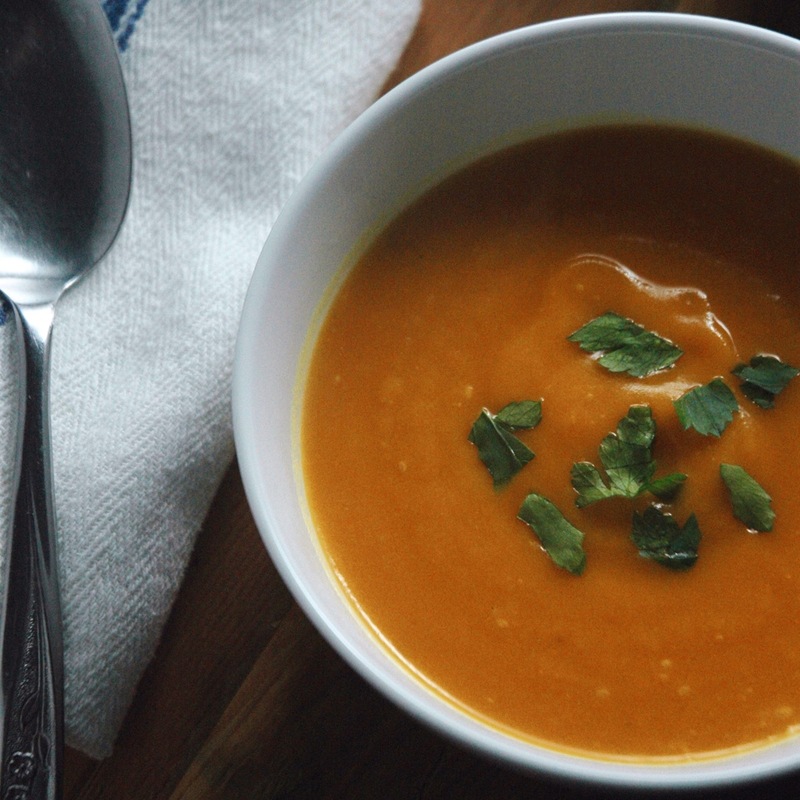 What I ended up with was a glorious, delicious, comforting creamy sweet potato soup. So simple… and so perfect. Making creamy vegetable soup, like this one, is really easy with an immersion blender (I use this one, and it’s great! ), but any blender will work fine. Just make sure to wait until the soup has cooled a bit before blending, and don’t overfill the blender unless you want to paint your ceiling orange. Aside: I actually did turn the “soup” into a pizza sauce, and it was amazing. Recipe for that coming soon here! But, in the meantime, I wanted to highlight the delicious simplicity of this soup first. Because it deserves the spotlight. It just does. The end. 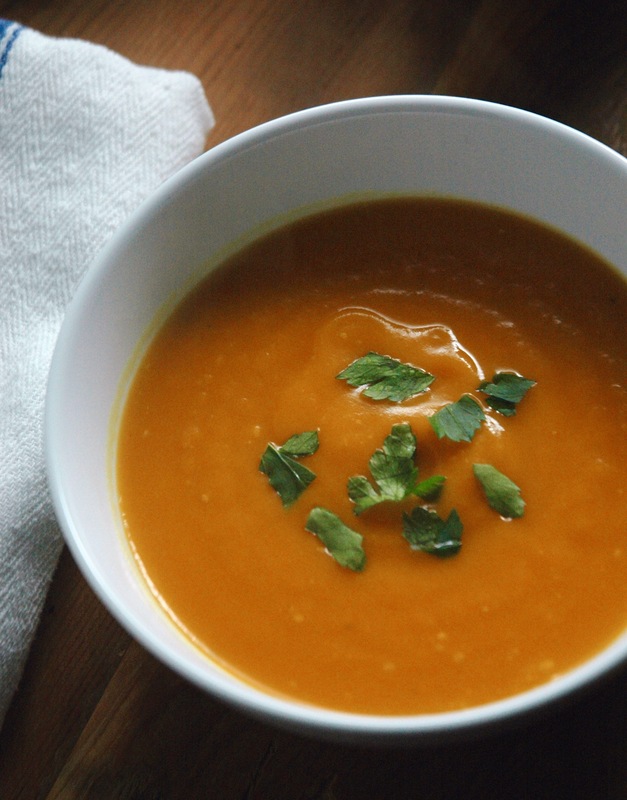 A simple yet decadent and comforting sweet potato soup. Peel and chop sweet potato into 1/2" chunks. Peel and dice onion. Peel and mince garlic cloves. Heat olive oil in a heavy pot over medium heat. When oil is hot, add onions and sauté, stirring occasionally, until soft and translucent (5-10 mins). Add garlic and red pepper flakes, and cook until fragrant (about 1 min). Season with salt and pepper. Add sweet potatoes and stir to combine. Add bay leaf and just enough water to cover the veggies. Bring to a boil. Turn the heat down and simmer until potatoes are soft (15-20 mins). Use an immersion blender and puree the ingredients until smooth. Season with salt and pepper to taste. If you don't have an immersion blender, let the soup cool and transfer to a blender in parts. Then reheat to desired temp.